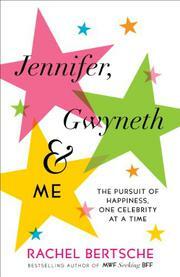 One writer’s attempt to “celebrify” her life by following the examples of today’s leading ladies in pop culture. In her opening introduction, Bertsche (MWF Seeking BFF, 2011) refers to the conundrum of celebrity culture as a classic “chicken-or-the-egg issue” in which she ultimately distills the problem into two questions: “Do we obsess over celebrities because we want to be perfect? Or do we want to be perfect because we obsess over celebrities? There’s no way to be sure.” These are valid questions that underscore the influence of the cult of celebrity, and though there is indeed no immediate answer, the questions themselves are a reminder that society is too fixated on the pursuit of looking and feeling good. This quest for perfection has led Bertsche to idolize a shortlist of celebrity women, all actresses except for Beyonce, who signify excellence in a particular quality of life. The author praises Jennifer Aniston for her toned body, Jennifer Garner for her perfect marriage and Julia Roberts’ Zen-like serenity. Readers witness Bertsche’s transformation from an undisciplined freelancer more likely to sleep in and snack than do yoga and prepare healthy meals into a monomaniacal, slightly watered-down version of a Stepford wife. Most troubling, however, is the book’s coda, which confirms the author’s delusional attitude when she looks forward to the day when she and her daughter can flip through the pages of celebrity magazines and “talk about the aspects of the stars we admire” and objectify at will. While Bertsche’s attempt to mold herself in the image of certain celebrities she believes are exemplars of fashion, physique, cooking, etc., is frivolous and superficial, not to mention at times embarrassing, some readers won’t blame her for at least trying to make a better life for herself, however misguided her efforts. A gratuitous work of celebrity worship.